We're happy to introduce Foodista Wine Editor Jameson Fink's new FREE podcast Wine Without Worry! Have wine anxiety? 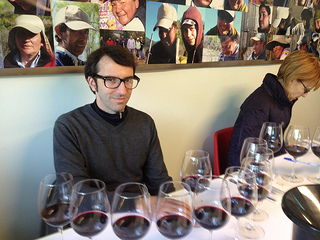 Put aside your anxiety and join Jameson as he serves up a flight of experts to demystify wine. It's a relaxed look at wine, with helpful tips and insight to bring your confidence level up, and keep the wine flowing. Below is a snippet of the podcast, click here to listen to the entire show. Hey, it’s Jameson Fink here bringing you Wine Without Worry and I want to talk with you about champagne. I know, it’s January. Could this show be more ill-timed, because the time to talk about champagne is just New Year’s Eve, right? Well, my New Year’s resolution is to convince you to think about champagne for the other 364 days of the year. You don’t need a special occasion or date on the calendar to open a bottle, in fact opening a bottle makes any day a special occasion, not only is champagne a beverage and a fueler of romance, but also one of the most food friendly wines on the planet. 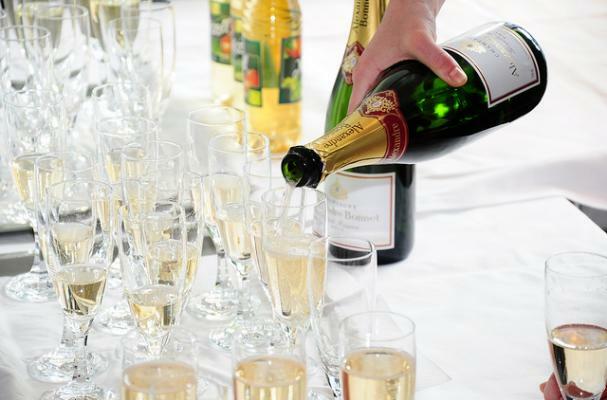 It’s remarkable what you can pair a champagne and the wide range or champagnes available to suit any cuisine. Now, I know that money doesn’t grow on trees or even grapevines and that’s why I’m making the distinction that you think about champagne year round and just ask that you drink it more regularly, not ever day of the year, though if you can and do you’re my hero. But think about cutting down on those fancy lattes and sock away a few extra bucks a day to come up with the funds to put champagne at least in the monthly rotation of your wine drinking, split a bottle with a friend, make a friend by sharing a bottle. Speaking of champagne and friends, I’m sitting here with Bryan Maletis, he owns Fat Cork, a company that does nothing but sells champagne and ship it to as many states as legally possible. I’m at his headquarters in Seattle surrounded by champagne bottles. It’s hard not to be distracted by all the sparkling awesomeness. So Bryan, you decided to start an online wine business that sells no red wine, no white wine, just champagne. Are you crazy? BM: No, I don’t think I’m crazy and neither does my wife. We started Fat Cork with the mission to provide a tool that helps people celebrate everyday occasions, therefore our mantra around here is celebrate every day and Jameson you led into it very well when you stated that, you know, a bottle shouldn’t be kept for a special occasion, but instead a bottle should be opened to create a special occasion. And that’s what we firmly believe, whether you can afford a bottle of real champagne or 10 or 12 bottle of Prosecco. And I’m glad you mentioned that too, the distinction between champagne and sparkling wine, you’re just starting to touch on that. I see a lot of things being called champagne that aren’t champagne. What is a champagne? What is champagne? BM: Well, first and foremost Champagne is a region within the country of France. So Champagne is a specific region and really anything coming from that region of Champagne has to be made in a specific manner. Download the free podcast and subscribe here. Stay tuned for more from Jameson and check out his website.